The Best location! Close to everything, just above Whistler Golf Course, the exciting Valley Trail and only 400 meters from the Village. Enjoy panoramic views of Blackcomb and Rainbow Mountains from the large skylights and picture windows. This quiet, spacious non-smoking, 1275 square foot post and beam home sleeps six in comfort. It features vaulted ceilings, two bedrooms with queen beds, a spacious living room with a queen hide-a-bed, and large cozy stone wood-burning fireplace, two person Jacuzzi tub, washer/dryer, two plasma TVs, (one being 55 inches) DVD and extensive DVD library, WiFi, two bathrooms, private balcony, barbeque and a full kitchen complete with microwave, dishwasher, and gourmet Jennaire. This unit is well-equipped providing all one needs for a memorable stay. Free, covered parking is steps away. ****TO AVOID CONFUSION, when looking at rates, check that they are posted in the currency you desire. On the rate page there is a currency converter in the upper right. Golf course is located down the steps from the complex. We provide all you need for your cooking needs. 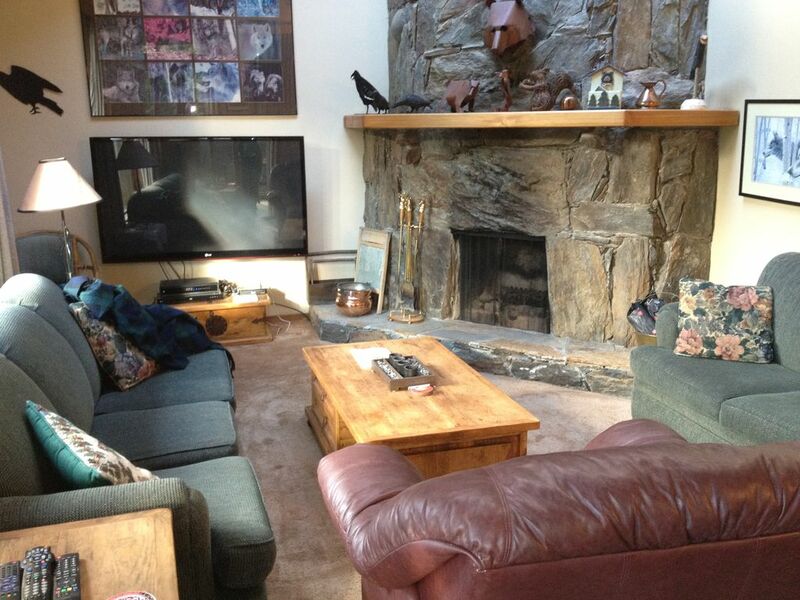 Great location, close to Whistler Village. The village is within walking, even in windchilling temperatures! The condo was very clean and quiet. The parking was conveniently located in a covered garage with an assigned parking spot. We loved all of the wildlife decor! Definitely recommended for a family visit to the mountains. Hosts are responsive, friendly, and easy to communicate with. Thanks for your hospitality! My wife and I along with another couple had a great time here. Convenient location and very cozy. Look forward to returning another time! A lovely home away from home. Cozy, but plenty of room, well-supplied kitchen, comfortable lay-out, easy walk to village and ski slopes. Whistler Cay Heights is conveniently located just an 8-minute walk from the Village, but a rental includes free underground parking if you have your vehicle and would prefer to drive to get yourself around. The Cottage is perfect for sports-lovers or travelers, who want to either spend the day on the mountain or relax and meander through Whistler’s myriad of designer stores and local art galleries. There is also a wide array of restaurant and bar options in the Village, making it convenient to pick a place everyone will love. Some nights we stayed in and cooked for ourselves and ate in front of the wood-burning fireplace, but there is also a sitting area in the fully-equipped kitchen. And at the end of the day, we got to curl up and go to sleep in the really comfy beds! We enjoyed our stay here, and would highly recommend it, as it is perfect for a couples’ getaway or even a small family. Perfect place to relax & settle into the Whistler lifestyle. I stayed at this lovely townhouse for 12 nights this month and it was just what I needed. Close enough to the village but not too close.... It takes about 7 minutes to walk into Whistler Village on the valley trial. I had two bedrooms & two bathrooms & a sofa couch so when friends came up for a night from Vancouver I could easily accomodate them. The owner was helpful & prompt in answering any questions I had. The place was clean & well maintained. I would recommend this to family and friends. Next time I holiday in Whistler i'll get in touch. This was our annual summer vacation with our daughter and 2 grandchildren (ages 7 & 10). This wonderful vacation rental is everything it says and more! It is a large condo with comfortable beds, great hot showers, beautiful quiet location, walkable to all activities, clean and has a great, well stocked kitchen! The owners were very responsive in helping us set up this rental and were available for any questions we had. I would not hesitate to recommend this VRBO to anyone that's looking for quality in a fun, beautiful location! Don't forget to look online for a 2 for 1 special (days) for the PEAK 2 PEAK Gondola.